GAIL (India) Limited, invites applications from Indian nationals fulfilling the eligibility criteria for filling up GAIL Senior Engineer posts as per category wise vacancies. Interested candidates may apply from the details given below in order to apply for particular posts. 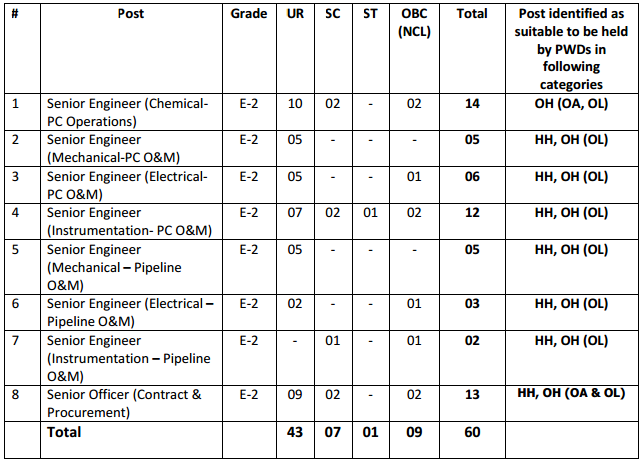 Detailed eligibility criteria along with experience required for various GAIL Senior Engineer Recruitment is given below. Bachelor Degree in Engineering in Electrical/ Electrical & Electronics with minimum 65% marks. Minimum 01 (One) year post qualification executive in line experience in operations & maintenance of Oil and Gas cross country pipelines in hydrocarbon sector (including experience as GET/ ET/ MT) of State/Central Government Undertaking(s) and/or Large Private Sector Organization(s) as an employee of that Undertaking/ Organization. Bachelor Degree in Engineering in Chemical/ Mechanical/ Electrical/ Instrumentation/ IT/ Computer Science/ Electronics/ Metallurgy / Civil/ Telecommunication with minimum 65% marks. The Upper Age Limit for various posts as given above is 30 years as on 22.09.2015. The upper age limit is relaxable by 05 years for SC/ ST candidates, 03 years for OBC (Non‐Creamy Layer) candidates. In case of Ex-servicemen who have put in not less than six months continuous service in the Armed Forces 03 years the maximum age limit prescribed for the posts/ services for which a candidate seeks appointment, he/ she be deemed to satisfy the conditions regarding the age limit. After submitting the application online, candidate is required to download the Application Form generated by the system with unique registration number, space for photograph and signature and other details. Applications not submitted online properly and/ or application which are in “draft mode” will not be considered. The candidate has to send one print out of the Application Form duly signed and affixing latest passport size colour photograph along with required demand draft (wherever applicable) and attested true copies of testimonials/ documents. Document in support of Date of Birth proof. Caste/ Tribe certificate [for SC/ ST/ OBC (NCL) candidates as applicable] in the prescribed format issued by the Competent Authority as prescribed by Government of India. OBC (Non Creamy Layer) category candidates are required to submit latest caste certificate. Ex‐servicemen Proof (in case of Ex‐servicemen candidates). .
All Certificates/ Testimonials in respect of qualifications (all semester/ year wise Mark Sheet, Degree and Diploma certificates starting from matriculation onwards). Complete and proper Experience certificates/ Documents issued by the Employer in support of experience details mentioned by the candidate in the online GAIL Application Form. Candidates will be selected based on Group Discussion and/ or Personal Interview for the position of GAIL Senior Engineering in the above disciplines. Category (SC/ ST/ OBC/ PWD) once filled in the online application form of GAIL will not be changed and no benefit of other category will be admissible later on. Relaxations / Reservations for SC/ ST/ OBC (Non Creamy Layer)/ PWD (Degree of disability 40% and above) as per Government Directives are applicable. GAIL reserves the right to raise the minimum eligibility standards. The Management reserves the right to fill or not to fill all or any positions without assigning any reason whatsoever. GAIL also reserves the right to cancel/ restrict/ enlarge/ modify/ alter the recruitment process, if need arises, without issuing any further notice or assigning any reason whatsoever.